Nick Gordon was walking out of a Starbucks Sunday, holding a Frappuccino in one hand, when a $10 million civil compaint levied against him was shoved into his free hand, the New York Daily News reports. 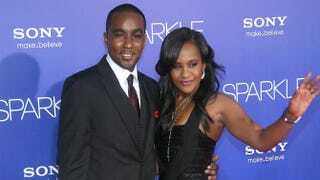 Gordon was officially served with the lawsuit that Bobbi Kristina Brown's court-appointed representative filed against him in June. In the complaint, Gordon is accused of being abusive toward Brown, including punching her in the face during one incident—a blow that reportedly knocked out her front tooth. He also allegedly dragged her "upstairs by her hair," the suit claims. The document also reveals information about the day Brown was found facedown and unresponsive in a bathtub: Brown's mouth was allegedly swollen and a different tooth had been knocked out, the complaint alleges. The suit says that Gordon and Brown had gotten into an intense argument earlier that day. Gordon probably doesn't have 10 cents to rub together—but it's the truth and vindication that Brown's family is likely seeking.